The SOLFRUNT 1980 process gauge is available with brass/phosphor bronze wetted surfaces and a solid front PET case. Brass/phosphor bronze is a lower cost option in pressure gauge applications that do not need 316 SST or Monel. The 1980 process gauges have a solid front PET turret style case for chemical and petrochemical processing applications. The PET material gives this case superior impact strength and a broad spectrum of chemical resistance. They are available dry or as liquid filled gauges with an EZ Fill case. The EZ Fill case is designed to facilitate filling in the field without special tools. 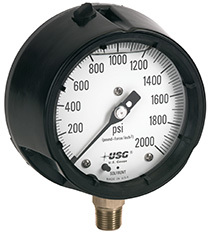 The 1980 process gauges are supplied in 19 vacuum, compound, and pressure ranges from 30" Hg vacuum through 1000 psi gauge pressure. Dual scale dials are available for every range.